What types of temperature measurement devices are available? Thermal imaging cameras - use infrared radiation as visible light on the screen to allow users to see where there is hot or cold spots. They can be used in any level of lighting. Most of the time, the cameras are handheld and can have improved communication features such as wireless connectivity. As an example, this allows a user to send an image to a skilled engineer when troubleshooting. Digital thermometers – feature a digital display for an easy, visual reading. They use sensors and probes to measure temperatures more accurately than traditional mercury thermometers. They're usually easy to transport and some will offer both Fahrenheit and Celsius readings. Infrared thermometers – determine the temperature by recording the thermal radiation, this is a contactless method. They're easy to use, provide fast readouts with high accuracy. 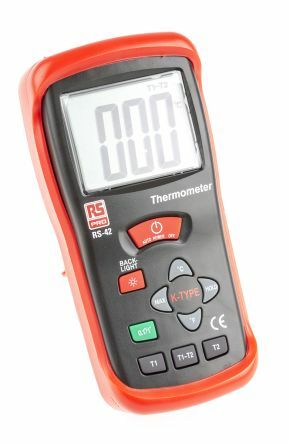 Some of the most common uses for IR thermometers include checking for hot and cold spots in a home that may determine leakage of air or they can be used to detect hot spots on electrical circuit boards. 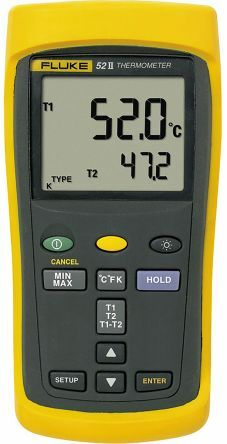 Temperature probes - attach to a measurement device, such as a digital thermometer or a thermostat. The probe measures the temperature of an area that it is in, then provides an accurate and fast measurement of the temperature. Liquid in glass thermometers – the most well-known type of thermometer. They feature a glass tube that contains a bulb filled with mercury at one end, usually red or silver in colour. As the temperature heats up, the mercury rises through the tube and a reading can be taken from the scale. Other devices may produce results with higher accuracy. Calibrators - measures temperature through bi-metals, creating a small amount of voltage when they are combined. 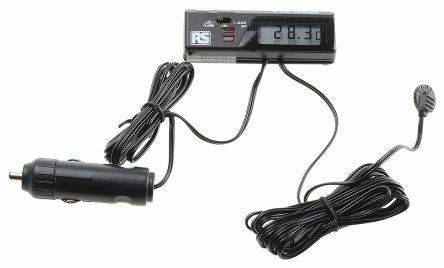 Good calibrators ensure the highest level of accuracy in the temperature measurements you can achieve. They're categorised into 3 types; drywell calibrators, RTD calibrators and thermocouple calibrators. Powered by 12V car cigarette lighter socket3m external, weather proof temperature sensorAccuracy of ±1°C between the operating temperature of 0°C to +40°C (resolution 0.5°C)Audible and visual alarms to warn of hazardous road conditions (icy/slippery)°C/°F selectableBacklit LC display.